Des Moines (pictured) has been a haven for Wells Fargo, which has 8,000 employees based in the area. WEST DES MOINES, Iowa  Spurred on by US$56.5 million in state and local incentives, Wells Fargo (www.wellsfargo.com) is riding into West Des Moines, Iowa, with as many as 5,300 jobs in a $118-million, 900,000-sq.-ft. (81,000-sq.-m.) expansion. The project is the largest job-generator in Iowa's economic development history, according to state officials. Of the 5,300 jobs that Wells Fargo Home Mortgage and Consumer Credit Group could position in its new two-building complex, 2,000 will be new positions, company officials said. The San Francisco-based unit of Wells Fargo & Co. will transfer as many as 3,300 other existing jobs to the new office facilities. Most of those transfers, Wells Fargo Mortgage President and CEO Pete Wissinger explained, will come from the 10 facilities the company currently leases in Greater Des Moines. As that large leased swath suggests, Iowa's capital city holds a huge Wells Fargo presence. The nation's fifth-largest banking company has 8,000 of its 9,400 Iowa-based employees in the Des Moines area. "Forty-nine other governors - make that 50 with Arnold Schwarzenegger's election - would like to be standing here," Gov. Tom Vilsack (pictured) said at the project announcement. Even so, central Iowa didn't automatically have the project snugly buttoned in its back pocket. Wells Fargo Mortgage earlier this year made it known that it was considering other states as well, including Arizona, California, Illinois, Minnesota and South Carolina. And incentives were one part of what it was considering, the company said. The state's large $54.9-million incentive package will yield large economic benefits, Gov. Tom Vilsack (D) repeatedly emphasized in unveiling the project. "It's important and necessary for folks to understand that these new jobs are critical for us," Vilsack said at the expansion announcement at Wells Fargo Mortgage's 176-acre (70-hectare) site. "Forty-nine other governors - make that 50 with Arnold Schwarzenegger's election - would like to be standing here." The governor cited a state analysis that projected a $627-million, 10-year local-area economic impact. That impact will flow from payroll for Wells Fargo Mortgage's new jobs, capital investment for new facility construction and property taxes, he noted. The end result for Iowa, explained Vilsack, is a payoff 27 times greater than Iowa's investment. "If we could all make that kind of return, we'd all retire," Wissinger said. And the state's projected economic impact, Vilsack pointed out, doesn't include the spin-off jobs "that take place, when good jobs are created and people feel confident and comfortable investing their resources in a community, in a home and in an area." Wells Fargo Mortgage's new jobs, he explained, will be solid and sought after, with $33,500 average annual salaries. The 5,300-employee Wells Fargo Home Mortgage complex will sit just south of the $200-million Jordan Creek Town Center (pictured in rendering) that's now being built. Mall owner Knapp Properties also sold Wells Fargo Home Mortgage the site for its expansion. Wissinger characterized the project as "definitely good for Wells Fargo, but also good for Iowa. Our decision will ultimately benefit the business community and residents of Greater Des Moines and prove to be a sound investment in infrastructure by the state of Iowa and the city of West Des Moines." And the Wells Fargo executive did touch on the expansion's multiplier potential. "The area will benefit not only from the direct economic impact of our project," Wissinger said, "but by the fact that the resulting infrastructure will serve as a catalyst for the development of the surrounding properties and provide greatly improved access to the Jordan Creek Town Center [a $200-million mall that's being built just north of Wells Fargo Mortgage's site]."  $25.9 million from Iowa and West Des Moines for road, water and sewer improvements, with $16 million of that amount coming from the West Des Moines City Council and $9.9 million coming from the Iowa Department of Transportation. "There are a lot of intangibles" in all location decisions, Wissinger said. Some of West Des Moines' tangibles that the company particularly liked were business costs and labor, he explained. "Iowa offers us a high quality work force and is a great place for our team members to live," Wissinger noted. Wells Fargo Mortgage also liked the West Des Moines site which it bought from Jordan Creek Center owner Knapp Properties. But that tract was undeveloped and had limited road access. Those conditions account for almost half of the project's incentives going to ready the site, company officials explained. The West Des Moines expansion is being driven by the home mortgage market's rapid expansion, Wells Fargo officials said. Wells Fargo Mortgage officials didn't outline a timetable for building the two-building complex. But the company's agreement with West Des Moines requires that construction begin no later than July 2004. Yet another major Wells Fargo expansion could be in the offing for Des Moines. This time, Des Moines-based Wells Fargo Financial is the corporate arm in question. Wells Fargo's consumer financial division has been in discussions with the Greater Des Moines Partnership (www.desmoinesmetro.com) to add 1,000 jobs in downtown Des Moines. Wells Fargo Financial may have dropped one big shoe in the decision earlier this month, when it bought the vacant property across the street from the $90-millon headquarters it moved into last year. The new facility for the expansion would also house 1,000 transferred local jobs. Wells Fargo's rush of expansion activity reflects financial services' vitality in Iowa. The sector is the state's third-fastest growing industry, creating 24,500 new jobs between 1990 and 2002, according to analysts with Iowa Workforce Development. Arguments over approving Scripps Research Institute's incentives sometimes seemed to multiply like some lab experiment run amok. TALLAHASSEE, Fla.  "Like a game of chicken on steroids." That's how the Florida Legislature's vote on Scripps Research Institute's (www.scripps.edu) hefty incentives played out, said Florida state Sen. Jeff Atwater (R-North Palm Beach). Ultimately, Sunshine State lawmakers passed Bush's proposal for the Scripps subsidies. But Florida's support didn't come without frequent flare-ups. Much of the legislative heat materialized in the wide-ranging expenditures that were added on to the Scripps bill, multiplying like some lab experiment run amok. Eventually, those tack-ons totaled $90 million; the biggest was a $33-million sales tax break for all of the state's convention centers. Most of those additions were spurred by some legislators' fears that only South Florida would benefit from Scripps' project. "We need to share those resources; it's not right," Sen. Al Lawson (D-Tallahassee) charged after rural development funds were cut from the bill. "This is the biggest corporate welfare and the biggest scam I've ever seen." 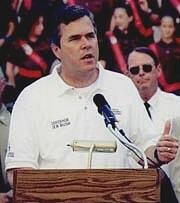 "Tonight's vote is a defining moment in Florida's future," Bush (pictured) said as the Scripps subsidies were approved. "This is an opportunity for the entire state, for all of us to better our community," countered Senate Democratic Leader Ron Klein (D-Boca Raton), who, with Atwater, steered the bill's passage." "We have an opportunity to change Florida," Klein insisted.  Forms a 20-year contract between Scripps Research Institute and the state through the creation of the Scripps Funding Corp. Both parties must ink the pact by Jan. 30, 2004, and a final contract must be executed by March 15.  Puts $310 million into Scripps Funding Corp. for salaries and equipment for the Florida research center.  Establishes a 15-year prohibition on Scripps' entering into agreements to establish biomedical research facilities in any states other than Florida or California.  Creates a nine-member Scripps Funding Corp. governing board, with three members appointed by the governor, three by the House speaker and three by the Senate president.  Requires that seven of the governing board's members approve any Scripps account spending for activities outside Florida.  Empowers the governing board to establish performance measures to hold Scripps accountable.  Requires Scripps' Florida operation to file an annual "activities and outcomes" report, due each year by Dec. 1 for the previous fiscal year.  Allows the Palm Beach County Commission to exempt from regular permitting procedures any project it designates as related to Scripps' expansion. Designated projects will receive expedited permitting.  Allows much of Scripps' Florida work to remain private through public records law exemptions. Senate President Jim King (pictured) cautioned Scripps, "We expect you to be even more successful in this state than you were in California, and we expect you to do it quickly." The 20-year contract also requires Scripps to hire 545 Florida employees by the end of its seventh year of operations. The governor's office is projecting far more dramatic long-term job creation. Bush has envisioned a 15-year impact of 6,500 Scripps jobs and 40,000 additional jobs from industry clustering. Scripps has apparently had that kind of effect with its headquarters in La Jolla, part of the San Diego metro. The institute's presence is credited with attracting 499 biomedical and pharmaceutical companies with 35,000 workers to the San Diego area. And 80 percent of those firms are located within a three-mile (4.8-kilometer) radius of Scripps' La Jolla complex. Florida lawmakers tussled over the reliability of the deal's projected long-term benefits. And some remained concerned after the vote. One was Sen. Tom Lee (R-Brandon), who voted for the bill, but still wished for "more of a connection between the $310-million investment and the 6,500 promised jobs." Bush, who had compared Scripps' arrival in Florida to those of NASA and Walt Disney, was elated. "Tonight's vote is a defining moment in Florida's future," he said from Miami, where he was attending a World Series game between the Florida Marlins and the New York Yankees. "The opportunity Scripps brings to our state is unparalleled, and the Scripps partnership is unprecedented." But grumbling persisted in Tallahassee even after the vote. One of the restless lawmakers was Senate President Jim King (R-Jacksonville). Stopped by a television crew on his way out of chambers, King turned to the camera and spoke directly to the Scripps executives already headed out for a West Coast flight. "We expect you to be even more successful in this state than you were in California," King said, "and we expect you to do it quickly." Scripps' chosen site will facilitate the kind of spin-off impact recorded in California. Palm Beach County has purchased a 1,920-acre (768-hectare) tract that was part of the Mecca Farms orange grove. The institute will use 100 acres (40 hectares) on the site for what Scripps President Richard A. Lerner called "a signature structure." Palm Beach County will be able to sell the rest of the land to companies that want to locate near the research center. The Business Development Board of Palm Beach County (www.bdb.org) put all of the sites that Scripps was interested in under contract while the institute made its decision. 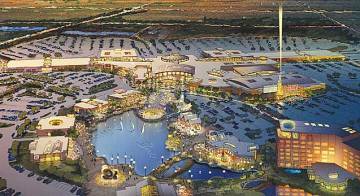 Palm Beach County bought the Mecca Farms land for $57.6 million. in Site Selection's January 2004 issue. Looking for a previous Incentives Deal? Check the Archive. ti0311bti0311b ©2003 Conway Data, Inc. All rights reserved. Data is from many sources and is not warranted to be accurate or current.